There are a lot of claims surrounding medium chain triglycerides and how they are more superior than coconut oil. Is it all hype? There’s a lot of hype surrounding medium chain triglycerides (or MCT). In fact, there are claims that MCT oil feeds your brain and jumpstarts your metabolism, but there’s no getting around the fact that MCT oil is a man-made supplement. Medium chain fatty acids no doubt have tremendous health benefits, but can you find all of those benefits in MCT oil? Is coconut oil, which contains naturally occurring medium chain triglycerides, a better alternative? Lauric acid is the most well known medium chain triglyceride. It is prized as a strong microbial that kills harmful pathogens like bacteria, viruses, and fungi. Coconut oil is 50% lauric acid (as a reference, breast milk–the gold standard in nutrition–is generally 6-10% lauric acid). In MCT oil the lauric acid is generally removed during the manufacturing process–tests on MCT oils show negligible or zero percentage remaining. 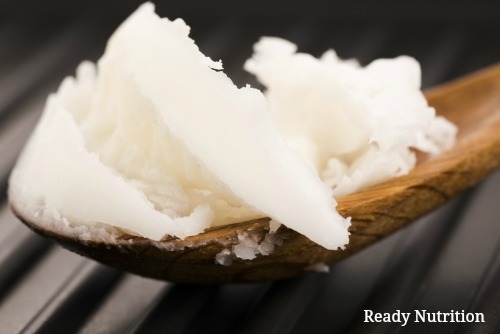 Lauric acid is what makes coconut oil solid at room temperature. MCT oil is by contrast liquid, even when cold. Though MCT oil is sometimes marketed as “liquid coconut oil” this is certainly not the case. With the lauric acid removed, the composition of the oil has changed dramatically. Naturally occurring MCTs are great for loosening bowels and keeping your digestion regular. Manufactured MCT oils, on the other hand, frequently cause intestinal distress. Even coconut oil, in large quantities, has been known to cause a tummy ache, but because of the concentrated composition of MCT oil, these effects are intensified. It’s also easier to take too much MCT oil because the serving size is generally much smaller than that of coconut oil (a typical starting dose of 1 teaspoon of MCT oil vs. 1 tablespoon of coconut oil). Another issue is that MCT oil means different things to different manufacturers. Some contain the chains C6, C8, C10, C12 (the numeral indicates the length of the chain)—or any combination of these. Using C6 alone has been linked to side effects such as a burning sensation in the throat and mouth upon drinking. There can also be large discrepancies between the quality of each brand of MCT oil, depending upon how and where it’s processed. Some MCT oils may contain chemicals, solvents or other byproducts that occur during processing. I expected MCT oil to be much more costly than coconut oil, but a 32-ounce jar of virgin, cold-pressed coconut oil costs $20, about the same price for the same amount of MCT oil. Still, since MCT oil is (as we’ve now learned) of lesser nutrition, potentially lower purity, and puts you at risk for more side effects, you’re better off with reaching for straight coconut oil! Get those same metabolism-boosting benefits, the nutritionally-dense lauric acid, and never worry about manufacturing by-products getting into your body. This is simply another case where real, whole food wins!